I am not arrogant enough to believe that ERP software vendors are the guardians of best practices. Nor do I blindly subscribe to the notion that the customer is always right. What I do know and believe is that a good implementation partner will balance customer needs and wants with the fundamental value proposition of the ERP software to ensure customers have relevant information to make informed decisions. The following blog posting will discuss some practical guidance that implementation partners can utilize to vet business requirements. 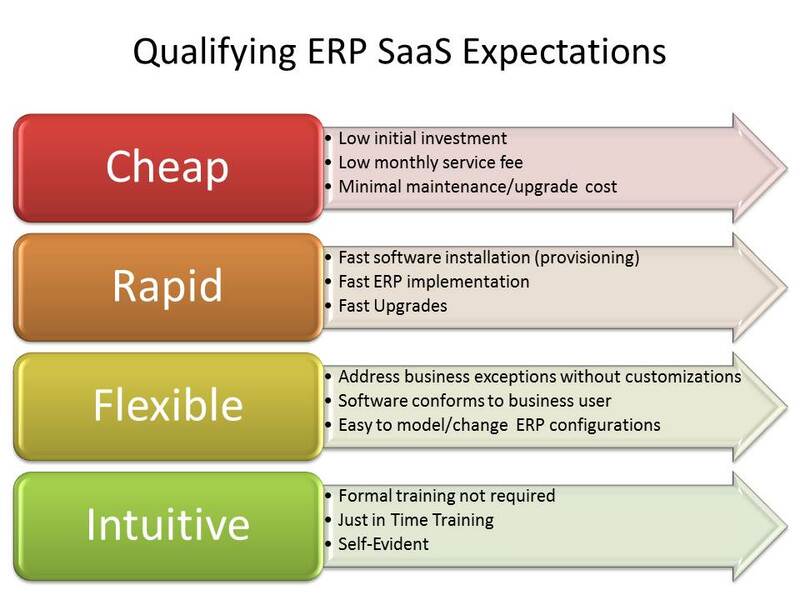 Knowing ERP functionality is simply not good enough. A competent implementation partner is able to advise and influence their customers to draw the right conclusions and make informed decisions. Next we will discuss how a good consultant guides the customer towards making an informed decision. Use questions to educate. Use questions to persuade. 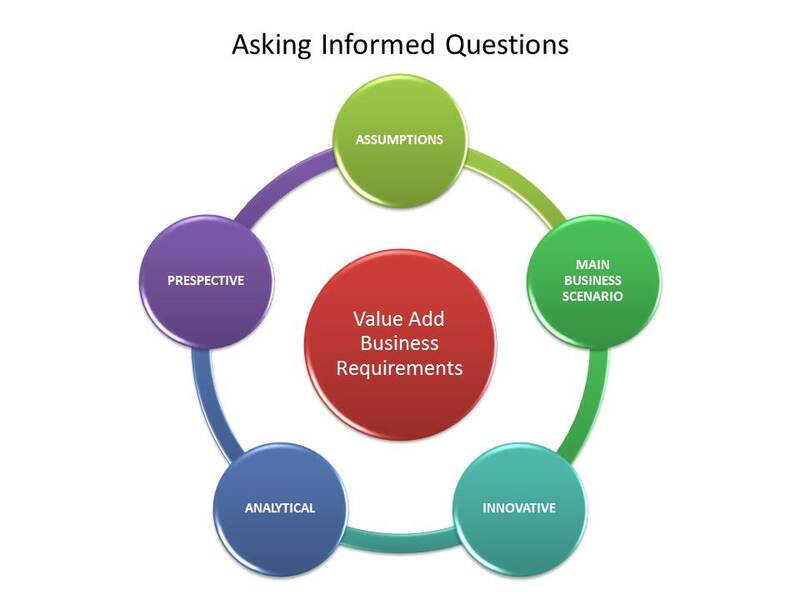 Questions should lead your customer to challenge assumptions and perceptions in their current environment. A perceived requirement may be a limitation of the current system or organizational structure. Just remember that asking the right questions is just the beginning to changing minds. As a third-party external resource with limited knowledge of the customer’s business model, there are limitations implementation partners will have on generating customer ownership and adoption. What consultants should do is facilitate and promote a process where relevant information is presented and evaluated. Do not evaluate business requirements in functional silos but as part of the larger business process across all business stakeholders. Visibility across the business process creates accountability – especially with peers within the customer’s organization. The basic value proposition of ERP systems is providing the automation of best practices – that is common business practices – across a broad market/industry. A direct contradiction against this key benefit is when a business requirement has to be addressed via a software customization. Additional scrutiny listed above should be undertaken to validate the additional investment required. A fundamental expectation that customers have for ERP solutions is to have a flexible and cost-effective business solution. A key assumption required for cost-effectiveness is that ERP “out of the box” functionality addresses the majority of the customer’s business model. 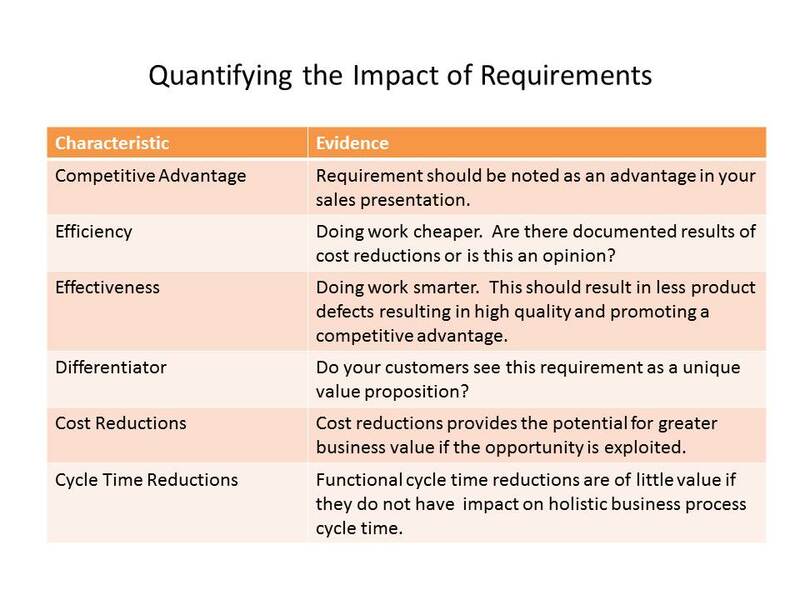 Customizations have both a short-term and long-term impact on cost effectiveness. 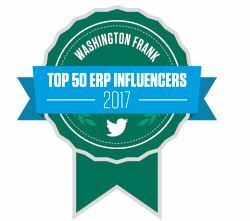 I am not arrogant enough to state that ERP software addresses all the best practices a customer may be utilizing. However, I have observed too many ERP implementation partners take the easy option of catering to user requests without leading the customer through a critical analysis to determine both the short-term and long-term implications of a specific customization. There are legitimate needs for customizations. It is not an ERP implementation partner to prevent customizations but rather to ensure that customers have appropriate expectations and conclusions as a result of their implementation decisions. 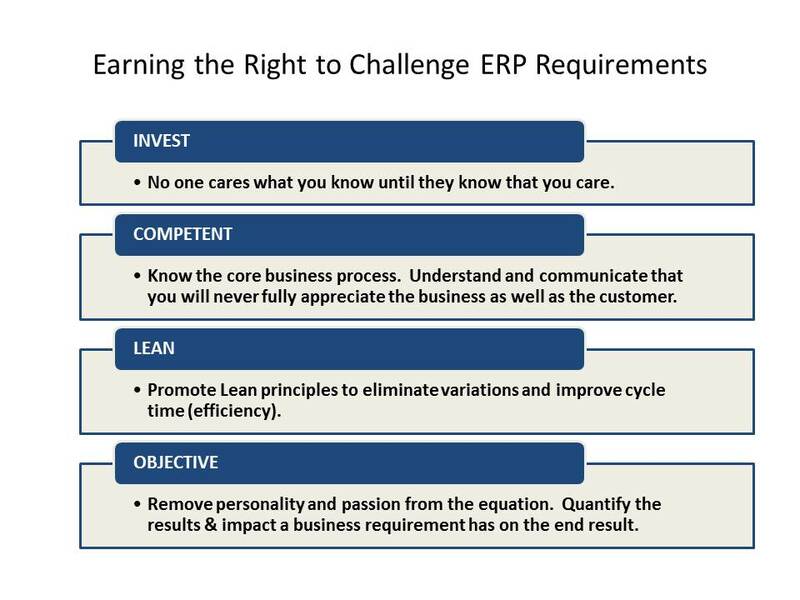 In my humble opinion, good ERP implementation partners educate their customers in how to best utilize ERP software to support their business. This not only requires ERP software knowledge and but more importantly requires the business acumen to understand current requirements and advise on future requirements. Customers, if you are looking for an implementation partner that can act as a leader then you will have to pay a higher rate versus a staff augmentation partner. ERP vendors play a very important role during an implementation – especially where it comes to best practices that are not delivered out of the box by the ERP software. ERP vendors should provide multiple processes and examples of working with customers to influence software roadmaps and/or co-develop automated solutions. Action speaks louder than words! True partnership requires an investment from every player. I think we can all agree that organizational fit is a key consideration for successful ERP selections and implementations. 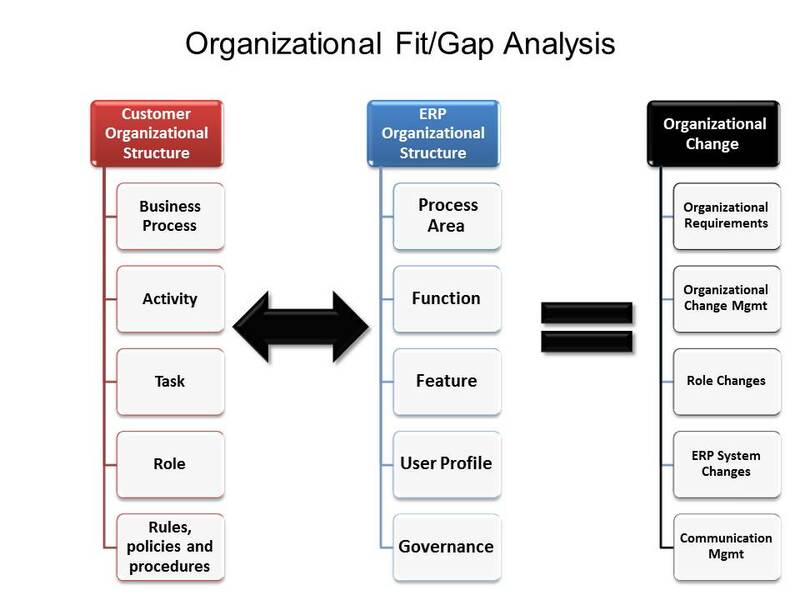 However, mention the phase “fit/gap” or “gap analysis” and most people will fixate on the ERP software. 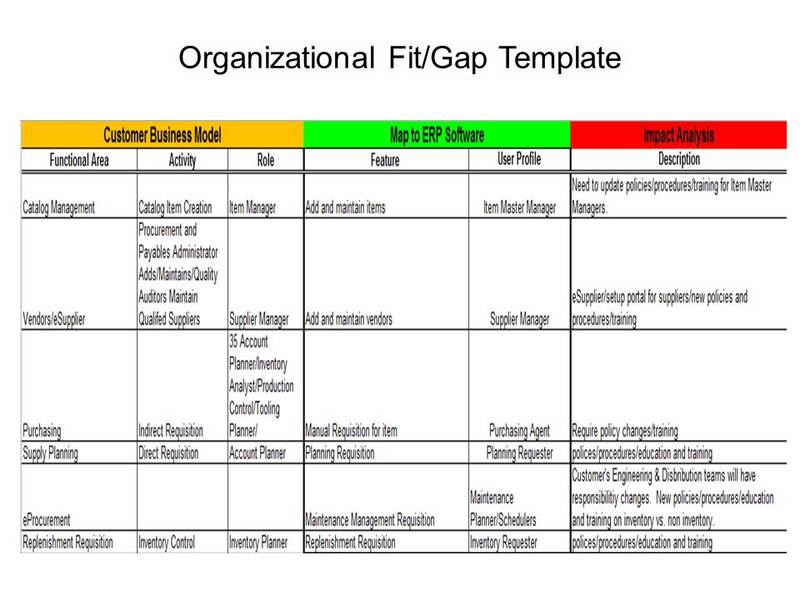 There are several examples of functional/software fit-gap templates/activities but very few organizational fit-gap templates/guides. The goal of this blog is to shed some light on this very important activity. What is an Organizational Fit/Gap? If you do not know what is changing in the organization then how can you manage organizational change? Too often I see ERP projects only focus on the “To Be” model and expect business users to figure out how to transition. I have also observed that customers see organizational change activities as an opportunity to reduce implementation costs by performing the activity themselves – regardless of their capabilities. Customer’s Organizational Structure and Business Processes A majority of peers and customers believe that this exercise is a non-value-add activity given the imminent organizational change that will occur as part of the ERP implementation. ERP Business Process Maps Consider ERP business process maps as a demonstration by the ERP vendor to show how their ERP software supports business processes. An organizational fit/gap analysis should be performed during the ERP selection stage and refined during the early design stages of the ERP implementation. Do not limit yourself to performing this exercise only once. The analysis performed during an organizational Fit/Gap will drive future decisions and implementation activities. What Activities should an Organizational Fit/Gap Influence? The organization fit/gap analysis will have a direct impact on your organization change management plan and communication plan. In addition, this analysis will provide insight into user security requirements. Utilizing this approach will highlight how well the predefined ERP user security profile(s) align to the organization’s existing users. As a general rule, the majority of predefined ERP workflows are based upon predefined user security roles; therefore keep in mind that ERP user security profile changes may require additional testing for related ERP workflows. Why Do We Need a Formal Organizational Fit/Gap? Conducting a formal organizational fit/gap enables you to quantify the level of change. Instead of taking a broad stroke at managing change you can provide a focused effort to accomplishing your objective. Remember that people are the most important component of a business solution. Given the importance I believe that formalizing this activity is worth the investment. Predefined ERP implementation tools, templates, roles can provide limited value to an implementation. Too often the ERP market wrongly perceives that these predefined components result in faster implementations. 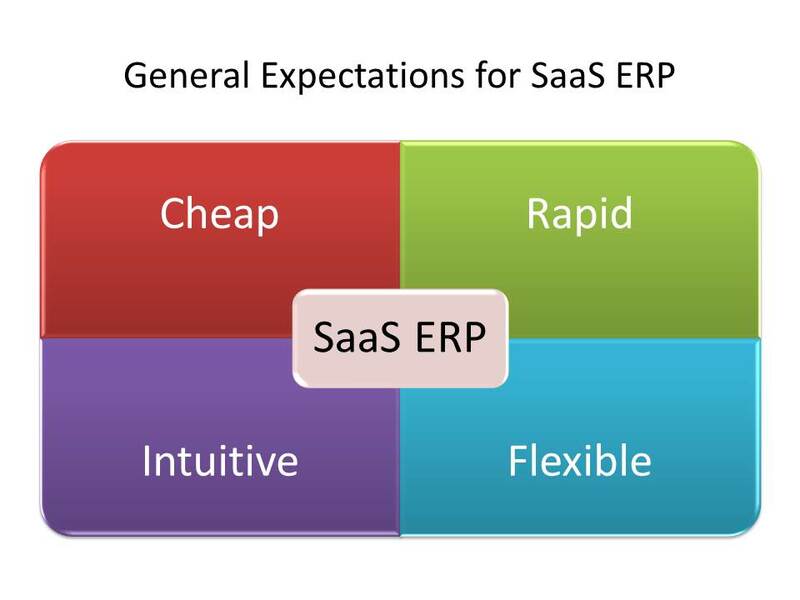 This misconception is most pronounced in the ERP SaaS/Cloud arena. At the end of the day, an ERP implementation should only move as fast as the customer can handle the change. Conducting a formal organizational fit/gap can enable the customer to adapt faster by focusing on the specific changes required for success. One of the first deployment models for cloud computing was Infrastructure as a Service (IaaS). Currently, there is a price war between the major IaaS providers like AWS and Rackspace to provide the cheapest infrastructure. However, enterprise customers looking to move their ERP solutions to the cloud should focus more on Integration as a Service (IaaS). Integration, not infrastructure, will have a greater impact to TCO and ERP success. In the next sections we will briefly compare the influences that infrastructure and integration have on an enterprise solution like ERP. Vendors cannot provide a material differentiation or competitive advantage. Technology improvements continue to drive down disk storage costs rapidly. Combine this trend with the economy of scale that cloud providers generate to continue driving costs down by another 40% in the next 3 to 5 years. Moore’s Law highlights the computing hardware trend resulting in greater technology capabilities and driving down MIPS costs. However, the same cannot be said for integration. As discussed in one of my earlier blogs (Best of Breed vs. 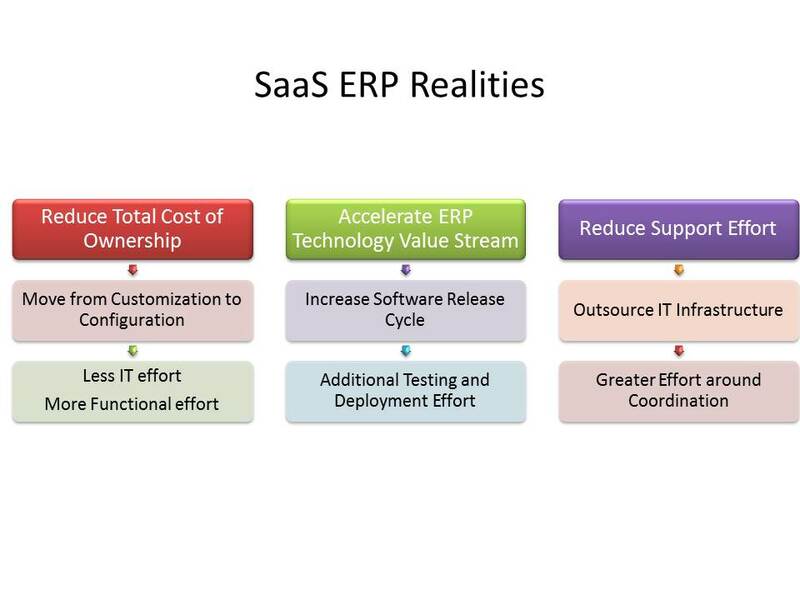 Integrated ERP), integration costs can be up to 8 times the cost of the ERP software. We have all heard the proverb “A chain is only as strong as its weakest link.” Applying this concept to business software, we would conclude that a business solution is only as strong as its weakest integration. Allow me to make the general statement that outsourcing IT infrastructure to a cloud provider should result in a cost savings to customers. However, I believe that IT organizations will quickly learn that providing this cost savings is a short-term value proposition to their business owners. Ultimately, IT-driven innovation will drive business value realization. Gartner identifies Integrated Ecosystems and Hybrid IT & Cloud Computing as two of the top 10 strategic technologies for 2013. Every ERP solution has a portfolio of edge products/3rd-party integrations to external solutions to provide holistic support of business processes. The only true method of creating business value is through business processes. The ERP software industry is realizing that people have the greatest impact on business results. It is refreshing to see the increase in socialization and collaboration capabilities. Infrastructure is necessary but integration is the critical path to success. History always has a way of repeating itself. Recalling the Y2K problem, storage (infrastructure) was seen as a strategic/limited resource. This view resulted in the programming practice of representing the year with two digits and we all know how that came back to haunt IT organizations. Infrastructure is a cheap commodity when compared to a collaborative, enterprise integration framework. Infrastructure is a key enabler for cloud computing but integration will ultimately determine your success of ERP in the cloud.